Emerald Canyon in Parker, Arizona - less than 2 hours drive from Laughlin - gets the Two Guys Who Golf vote as the best value course we have ever played. As the pictures in this review will indicate, this is one tremendously beautiful golf course. Spectacular vistas abound along a track that weaves its way inside and around red rock canyons with deep desert ravines and abundant natural foliage and wildlife. Throw in top notch conditioning with excellent, true rolling putting surfaces, sculpted tee areas and bunkers, plus manicured fairways and you have the makings of a wonderful golfing experience. The Colorado River sits in the distance, and is frequently in view on the last leg of the journey from Laughlin. The hour and 45 minutes to 2 hour drive includes a trek through some beautiful terrain - and take our word for it - EMERALD CANYON is worth the drive! On property golfers will find a mat range and a putting green with practice bunker. The clubhouse includes a small pro shop and a dining area with home-made sandwiches, hot dogs, snacks, fruits and beverages featured. A beer or soda here, or from the beverage cart - costs only a buck and a half. 18 holes with cart on this premier layout during PRIME SEASON is just under $50! Don't expect picture windows, high ceilings and other luxurious clubhouse amenities - but do be ready to play on a course that is deserving of 4 stars (Golf Digest) - and in our book a 5-star value rating! The course is busy from January - March, but tee times can still be had. During the spring, summer and fall months, the course is wanting for more play. During our review round in mid-April, I was recovering from a night of gambling and in need of a great golf environment to get me going. Anything less would have found me merely going through the motions. Emerald Canyon was inspirational, and full of surprises. We did not expect this type of conditioning on a $50 golf course in the middle of a desert, especially along a track featuring such frequent and sometimes dramatic elevation changes. Each tee box is marked with bright blue, white and red yardage indicators - for the three sets which measure 6437 yards with a 130 slope, 5897 with a 119 slope, and 4756 with a 112 slope rating. Yardage stakes posted at 100/150/200 yards make club selection easier, and pin placements on the medium sized and mildly undulating greens rotate from front middle and back, with color coded flags. Generous fairways will often greet players off the tee, and the canyon walls may also turn out to be quite friendly, as shots ricocheting off have a good chance of finding the fairways. 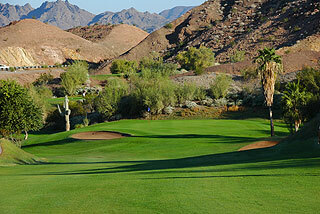 Despite the relatively short yardages and low slope ratings, Emerald Canyon certainly has its challenges. The beginner or high handicapper should move ahead to the white tees - but for the middle handicapper and average golfer we recommend the blue tee areas - as they present more opportunities to hit from the elevated tee stations that are often located on cliffs - providing tremendous character to the design. The front nine begins slowly, with the opening hole along a flat plain featuring a water hazard that appears along the right about 150 away, and creeps towards the fairway about 20 yards from the green. The par three second is long but simple, with plenty of room short. From here, the roller coaster ride begins. 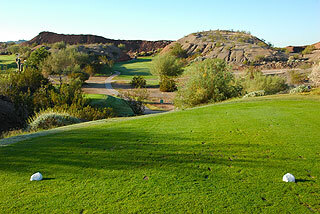 The par four 3rd doglegs left around a canyon outcropping, with a tee shot placed left center being preferable. Do not attempt to cut too much off, as the area behind the obstruction (mountain) is immediately desert brush. A shot flying the 150 marker is needed to navigate this hazard. 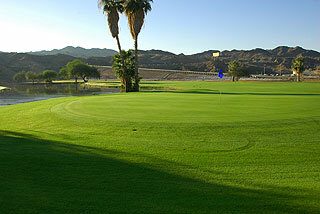 Land on the fairway and the approach to this gorgeous green complex is a simple one. The tee shot on the short (278 yards) par four 4th is an intimidating one. 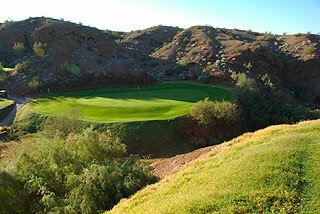 The initial thought may be to lay up between the canyon walls and play two mid irons. You MUST keep in mind that the green complex is tucked into a cove on the right - meaning the tee shot must land on the left side and breach the 100 yard area for a clear shot. Anything short or right will leave you with a blind uphill approach over the canyon wall. Fun! Take an extra club on this one. (see the third photo in this review) The fifth is a challenging three par from an elevated cliff to a putting surface that slopes from front to back. 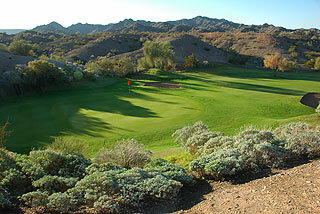 Don't be short, or the desert ravine will welcome your ball. 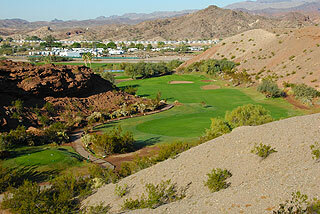 Shots hit long have a chance of bouncing off the mountain wall and landing on the green. Six plays over a ravine to a narrow fairway set between canyon walls. Left center is the place to be here, as anything right may leave a partially blind shot to the beautiful putting complex located at the bottom of the gorge. This is the course's # 1 handicap. The seventh presents a nice risk/reward opportunity from another elevated tee. It is very possible to drive the green here - and with an abundant fairway from 90 yards in, there is really no need to lay up. This stretch of canyon holes from 3-7 is one of the most interesting and enjoyable group we have encountered on all our visits out west - simply beautiful! Numbers 8 and 9 level off with the former featuring a sharp dogleg to the right, and the finisher on the front also bending in that direction, inviting approaches from just left of the tree line. The back begins with a group of 4 holes that play along a fairly even plain. Ten (623 yard par five) and eleven (217 yard par three) are simple long - very long - grip it and rip it!. Twelve doglegs right but a water hazard all along that side make a tee shot to the left center the recommended play off the tee. The approach will have to navigate the pond that rests immediately short of the putting surface. 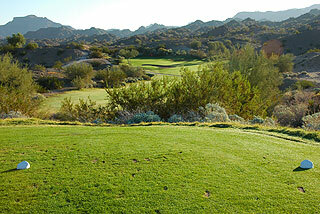 Number 13 plays fairly straight, with a desert area crossing the fairway a wedge shot away. Another stretch of canyon holes follows beginning with a 198 yard par three that plays a bit longer due to its uphill nature. Fifteen presents a very narrow fairway wedged between canyon walls, and is similar in nature (off the tee) to the third hole. The views from the blue tees on the16th present a wonderful view of the 15th green, and if you carefully climb the cliff and look back, there is a great panoramic view of the fairway with the emerald Colorado River in the distance. Number 16 also features a dramatic vista, and is a completely different hole from the back tees. The landing area is a tight one from the tips, but one can readily find an advantageous landing area from the white and red tees. A lay up in front of the huge fairway bunker is recommended - leaving a simple uphill approach. The final elevated cliff tee box is featured from the blues only on 17. From the fairway, it is important to land your second shot as near as possible to the second cliff - which drops off dramatically into the abyss near the 200 yard marker. There is plenty of room for error from here - as about 80 yards of fairway sits between the drop off and the raised putting complex. The closing hole features a water hazard all along the left side - which complicates matters as the canyon wall to the right will block the view to the green for anyone trying to approach from the safe side. Hit to the left center and there is an opportunity to reach in regulation, or take the water out of play and aim it safely to the right. In this case, a lay up just left of the mountain may be the best option, as the green is tucked neatly in a cove on that side. This is one of those tips which we feel will elicit an email of thanks for the recommendation...If you are anywhere in the area - call for a tee time and make the trip to Parker - no matter what time of year. Great course - great people. In the shoulder and off season, this course can be played for as cheaply as $20! Be sure to obtain a map and get accurate directions - there are a couple different ways to get there. 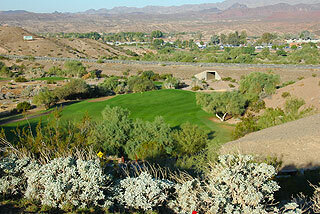 Once you near Parker (about 7 miles away) on 95, it is difficult to miss as the course is visible from the highway. For more info and a map - visit out informational page for Emerald Canyon - with a link to their web site, by clicking here. Enjoy!